A quiet voice within beautiful noise. About 8 years have passed since RiLF released their first album 'Ferris Wheel' featuring lovely vocals, simple band sounds, and a beautiful string orchestra. 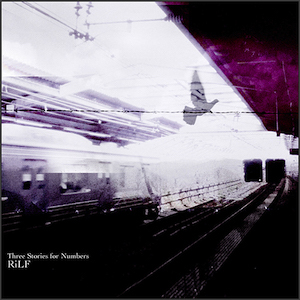 Now, we release their second EP 'Three Stories for Numbers’. RiLF, the alternative rock band formed by Calu who is the vocalist of Matryoshka, an electronica unit, and Takahiro Kido and Yuki Murata who are the members of Anoice, an instrumental music band, with magnificently violent guitar noise like Sigur Rós and My Bloody Valentine, solid drum grooves which supports the band sound and a quiet but strong voice, that creates a new take on shoegazing music. The album contains three tracks; ‘Count4', featuring a striking guitar riff, 'Into The 7th Sky’, adequately-filled by beautiful noise, and 'Room No.9’, sounding as if it was recorded as an improvisation in an iron room. Enjoy the new dark, yet beautiful music of RiLF. You can download this EP and the lyric sheet with Name Your Price on Ricco Label's official BandCamp page.